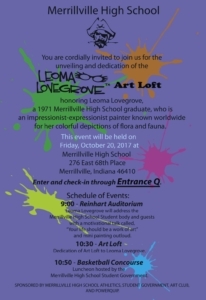 So I’m dying to tell you about Leoma Lovegrove Day at Merrillville High School! 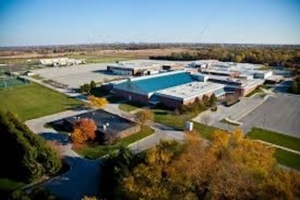 I’ve gotta say right from the jump that Cari Hooper and everyone else at Merrillville High didn’t miss a trick. Their attention to detail was AMAZING! When Mike and I got there, we were greeted at the front door by the band, the cheerleaders and a color guard. It was like something from out of an episode of American Idol – you know, when the finalists go back home. I’m not kidding, the band is 200 pieces strong, and they escorted us all the way from the front door to the auditorium, where I gave my talk and painted live from the gym floor. We walked in the drum section, so I was wired by the time we arrived in the gym. 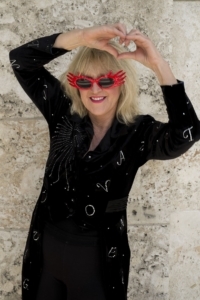 Whether I’m doing a Paint Out Loud performance or giving a talk at Florida SouthWestern State College on how to make your life a work of art, I’m always high energy. 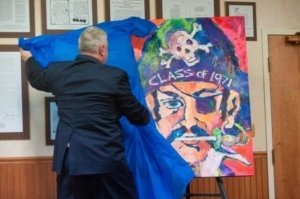 But I wasn’t prepared for the reception my old high school gave me. 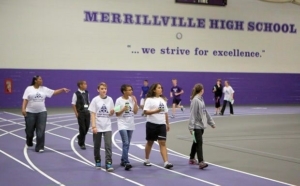 Although there are more than 2,200 kids in the Merrillville High student body, the auditorium only holds 700 kids, faculty and administrators. I was expecting to contend with quite a bit of chatter, but they were so into what I was saying that you could hear a pin drop in there. They didn’t want to miss anything I was putting down. Of course, I did a painting to the Beatles and Michael Jackson’s “Man in the Mirror.” At that point, the faculty had turned the house lights down low and suddenly, I look over my shoulder and hundreds of kids are holding their cell phones over their head with the lights on like they do at concerts. It was kinda funny, because they’re not supposed to have their cell phones on them while they’re at school. The kids ate it up. One of the things they asked me to do was throw a football to t he student who has the title of this year’s Mr. Football. 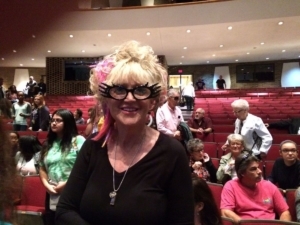 Well it just so happened that among the family and friends who came to hear me talk was my brother, Tom, who was a year ahead of me – part of the Class of 1970. Tom was very athletic, played football and was, you guessed it, Merrillville High Mr. Football 1970. So I Leomatized the football, had Tom join me on the floor of the auditorium, and asked him to throw the football for me. What a moment! My brother, Mr. Football 1970 threw a perfect spiral to Mr. Football 2017! And yes, he completed the pass! There’s more to the trip, and I’ll tell you more tomorrow, but before I close for today, there’s one more story I want to share. Whew! I’m not sure I can convey just what the whole day meant to Mike and me. After Irma and everything that went with it both before and after the storm, we really needed a morale booster. This was the perfect fix. 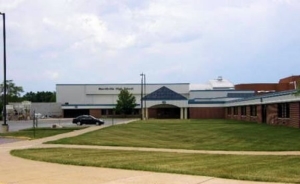 Thank you Merrillville High – students, faculty and administrators. It was the event of a lifetime!